We're talking skin care today! The weather is cooling down here in Georgia and it seems like fall will finally arrive! It'll be a slow arrival, but nonetheless, fall is still on its way to the south! I've learned that when the seasons change, I've also got to make some slight changes in my skincare routine. It doesn't switch up too much, but when the weather get colder, I make sure that my skin stays hydrated and moisturized. 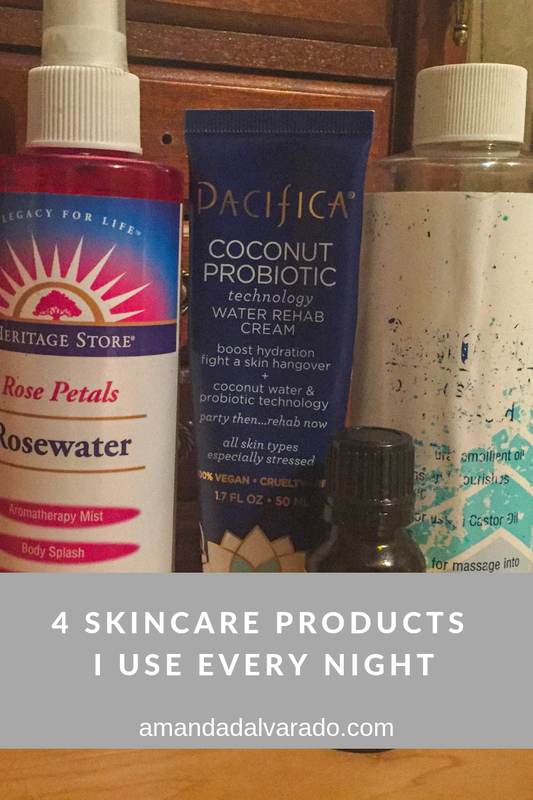 I've been playing around with skincare products over the past few months and finally have a skincare routine that I am crazy about. My skin has never looked better if we're being honest. These products have become my holy-grail products and won't break your budget. I am the queen of a good bargain and pinching pennies. After I shower, I put a little bit of Pacifica's Coconut Probiotic Water Rehab Cream on my fingers. This stuff is so hydrating. I'll also add a drop of castor oil, which is also very moisturizing, has anti-inflammatory benefits, and reduces acne; and frankincense oil, which heals skin and prevents signs of aging and also has anti-inflammatory benefits! I massage this into my face and this leaves my skin glowing! Also, massage this stuff in! A facial massage works wonders! After that, I spray rosewater all over my face and neck. I think rosewater is like all the rage right now, but I mean, it is literally magical. No joke. Rosewater has anti-inflammatory benefits and helps with irritated skin, acne, and eczema, which I get occasionally on my face. It's not pretty, but rosewater helps so much! This whole routine just takes a couple minutes every night, but my skin has never looked better! What is one of your holy-grail products? Hey! My name is Amanda and welcome to my little corner of the internet where I talk about being a living your best life, beauty, travel, college, and just life in general. I work in broadcast media and love to bake, catch up on entertainment news, and travel.